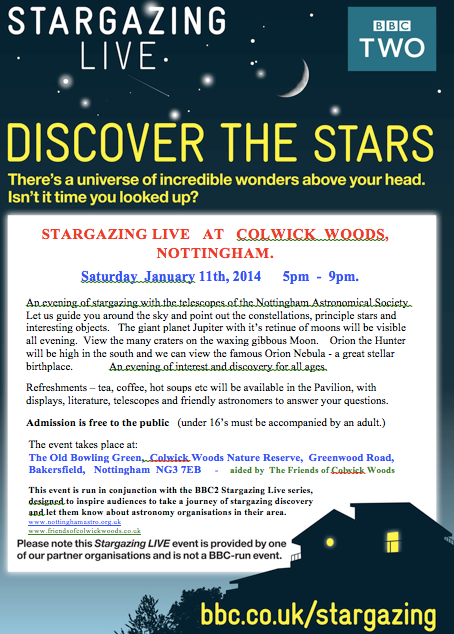 The Friends of Colwick Woods are hosting an evening of stargazing with the telescopes of the Nottingham Astronomical Society. The event is part of the BBC's 'Stargazing Live' programme. Saturday January 11th, 2014 5pm - 9pm. The giant planet Jupiter with it’s retinue of moons will be visible all evening. View the many craters on the waxing gibbous Moon. Orion the Hunter will be high in the south and we can view the famous Orion Nebula - a great stellar birthplace. An evening of interest and discovery for all ages. Refreshments – tea, coffee, hot soups etc will be available in the Pavilion, with displays, literature, telescopes and friendly astronomers to answer your questions.